The FTD® Classic Beauty™ Bouquet exudes a sophisticated grace to bring unmatched elegance into their everyday. 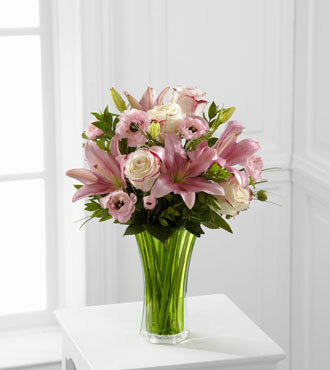 Pink ranunculus, bi-colored pink and white roses, pink Asiatic lilies, bear grass and lush greens are exquisitely arranged within a green flared glass vase to create a bouquet expressing sweet happiness for your special recipient. GREAT bouquet includes 11 stems. Approx. 18"H x 14"W. GREATER bouquet includes 15 stems. Approx. 19"H x 15"W. GREATEST bouquet includes 19 stems. Approx. 23"H x 19"W.